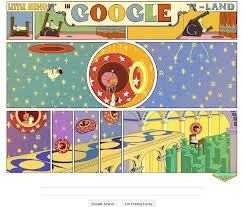 Today 15 October Winsor McCay's 107 th Anniversary to Celebrate Google and All Usa People. 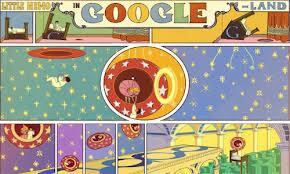 Today 15 October celebrate the 107th anniversary of Winsor McCay's comic strip series Little Nemo in Slumberland, Google posted an animated, interesting doodle on its homepage. The doodle is the first of its kind to feature an interactive, motion picture comic strip. But, who was Winsor MacCay? Born on September 26, 1869, Winsor Zenic McCay was an American cartoonist and animator. He was quite known for the comic strip Little Nemo, which began in 1905. Regarded as a comic-strip art masterpiece, the weekly strip first appeared on October 15, 1905 in the New York Herald as Little Nemo in Slumberland and later in New York American as In the Land of Wonderful Dreams. He was also known for the animated cartoon Gertie the Dinosaur (1914). Due to certain legal reasons, Winsor worked under the pen name Silas on the comic strip Dream of the Rarebit Fiend. 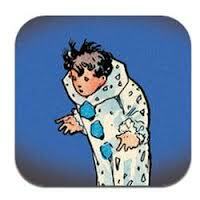 Winsor McCay was originally named Zenas Winsor McKay, in honour of his father's employer, Zenas G. Winsor. However, he later dropped the name Zenas. In 1889, McCay went to Chicago to study at the Art Institute of Chicago. But but due to lack of funds, he had to find a job. After working for two years, Winsor moved to Ohio and started working as an artist for Kohl and Middleton's Vine Street Dime Museum. While in Ohio he married Maude Leonore Dufour. Winsor McCay's first major comic strip series was A Tale of the Jungle Imps by Felix Fiddle, and 43 installments published from January to November 1903 in the Cincinnati Enquirer. But, Windors's strips Little Nemo and Dream of the Rarebit Fiend, which was published under the pseudonym Silas, were both set in the dreams of their characters. McCay's cartoons were never highly popular, but his cartoons always had a strong following because of his expressive graphic style. 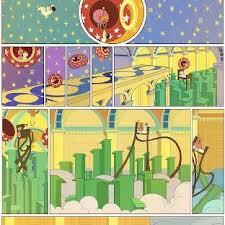 In the different panels of the Winsor McCay Little Nemo Google doodle the letters of the Google logo - GOOGLE appear in a chronological order. Winsor McCay was not only a newspaper cartoonist, but also a pioneer of animated films. He started off as a poster and hoardings artist and later moved to newspaper cartooning. 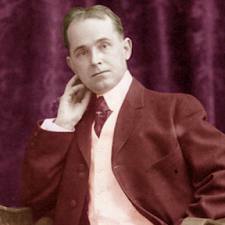 Winsor McCay died on July 26, 1934 of a cerebral embolism.